Encephalocele (pronounced en-sef-a-lo-seal) is a rare congenital (happening before birth) condition. Normally, the brain and spinal cord form during the third and fourth weeks of pregnancy. They are formed out of the neural tube. Most encephaloceles happen when the neural tube does not completely close when the baby’s brain, nervous system and skull are first starting to form. When the neural tube does not close, it can cause a sac-like bulge with brain tissue and spinal fluid to protrude through the skull. While scientists don’t know what causes encephaloceles, there is proof that women who eat a lot of foods with folic acid (Vitamin B9) during pregnancy are less likely to have a baby with the condition. Certain types of encephaloceles are also more common in women with diabetes. Most encephaloceles develop during the first month of pregnancy. Most encephaloceles happen when the neural tube does not completely close when the baby’s brain, nervous system and skull are first starting to form. When the neural tube does not close, it can cause a sac-like bulge with brain tissue and spinal fluid to push and grow out through the skull. While no one knows what causes encephaloceles, there are likely many factors that make it occur. A number of genetic syndromes are associated with encephalocele. Medical problems in the mother, such as diabetes, have been connected with the development of encephalocele. There is some evidence that being exposed to toxic chemicals, including certain medicines, could increase the risk of having a baby with encephalocele. In many cases the cause of the encephalocele cannot be determined. Encephalocele is part of a group of nervous system disorders called neural tube defects. Getting enough folic acid (Vitamin B9), before and during pregnancy can help prevent neural tube defects. Folic acid is found in leafy green vegetables, nuts, beans, citrus fruits and fortified breakfast cereals, as well as in prenatal vitamins. During pregnancy, there are several tests (called prenatal tests) that can help your doctors tell if your baby has an encephalocele. Encephalocele is usually discovered on prenatal ultrasound. Amniocentesis. Many babies with encephalocele also have other medical issues. Your doctor may recommend taking a sample of your amniotic fluid to look for certain genetic problems. Additional ultrasounds or magnetic resonance imaging (MRI). More detailed images of your baby can help tell your doctor how severe the encephalocele is, and if there are other birth defects. Sometimes, encephalocele isn’t found until the baby is born, when defects can be seen more easily. Once in a while, the condition is only discovered later in childhood, once a child starts to have physical or mental delays. Size, location and type of the encephalocele can greatly impact a baby’s survival, treatment options and physical and mental development. 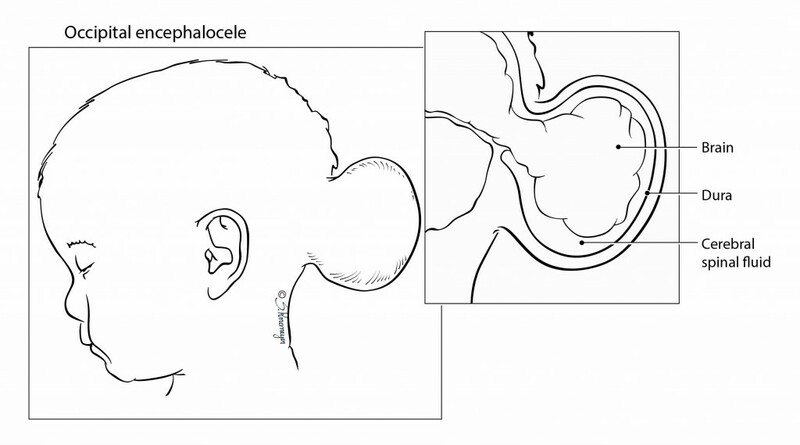 Meningocele: This type of encephalocele usually does not cause any major problems. The bulge through the skull contains only spinal fluid. 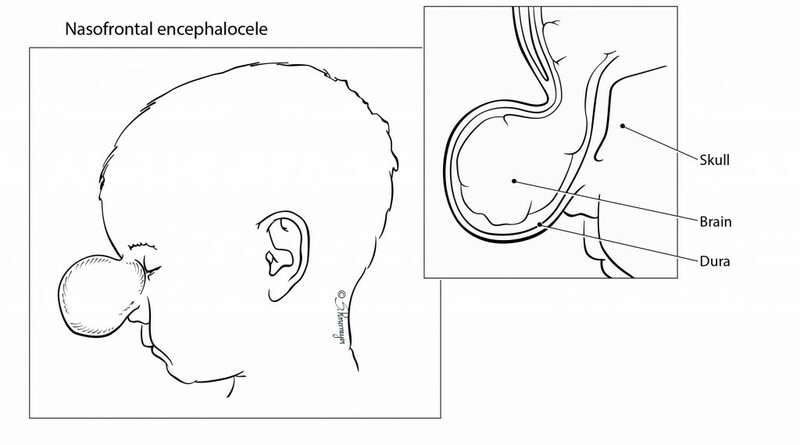 Meningoencephalocele: This is a serious condition causing long term neurological problems. The sac like bulge protruding through the opening in the skull contains brain tissue and spinal fluid. The brain tissue in the sac is not normal, and the rest of the brain may be affected as well. Frontonasal (between the nose and forehead). This type of encephalocele is more common in boys, and in other parts of the world (Southeast Asia). The survival rate for babies with frontonasal encephaloceles is very good. These babies are at risk for neurological problems, but the problems are less severe than for encephaloceles on the back of the head. Abnormalities in other organs: if other problems are detected, or genetic testing is not normal, babies have a worse outcome. If a test finds you are carrying a baby with encephalocele, you will continue to receive care from your doctor. You may be referred to the Ohio Fetal Medicine Collaborative (OFMC), which will help you connect with a team of experts at the Fetal Medicine Clinic at Nationwide Children’s Hospital. The diagnosis of encephalocele and the decisions that families need to make before the baby is born can be overwhelming and difficult. The expert staff at the Fetal Medicine Clinic knows how to care for babies with life-threatening conditions who require specialized medical care. They will help answer your questions and concerns, guide you through your pregnancy, and prepare you for what to expect. During your visit to the Fetal Medicine Clinic, you may meet with a number of pediatric specialists including a neonatologist (specialist in newborn care), neurologist (specialist in the brain), neurosurgeon (brain surgeon), and perinatal palliative care team member (specialist in symptom management and caring for babies with life-threatening illnesses). These specialists will explain to you what to expect for your baby, and support you with making decisions for managing your pregnancy and your baby’s care after delivery. Unfortunately, encephaloceles can lead to a miscarriage or still birth. Some families may choose not to continue the pregnancy. After birth, babies with encephaloceles will need to be evaluated at Nationwide Children’s to see if they can have surgery to repair the encephalocele. If the encephalocele is large, or other problems are found, some families may decide to take their baby home with comfort care, and not pursue aggressive medical and surgical treatments. After your visit, the medical team will work with you to create an individual plan for how your baby will be cared for after birth. This plan is based on your wishes and goals as well as information from your prenatal tests. You can change the plan at any time, and the medical team will fully support and respect your choices. Your doctor will watch your pregnancy closely. If the malformation on your baby’s head is very large, you may need to have a C-section. You should discuss any concerns about your pregnancy and labor and deliver plans with your obstetrician. We recommend that you deliver your baby at a hospital that is prepared to care for high-risk babies. Contact your doctor right away if you ever have any concerns. An intravenous line (IV) may be started in your baby’s arm, hand, foot, or head. The IV provides fluids, medicines, nutrients, and antibiotics to prevent dehydration and infection. Your baby may receive care in the hospital’s neonatal intensive care unit (NICU) or be transferred to the NICU at the main campus of Nationwide Children’s Hospital for further care. If you decide not to pursue aggressive medical/surgical treatment, every effort will be made to keep your baby with you at all times. A member of palliative care team may come visit you in the hospital to help you prepare to take your baby home. Most children with encephalocele will need surgery to reposition brain tissue and repair the skull. Surgery is usually done within a few days or months after birth. Your baby will need to have an ultrasound of the head/brain and an MRI of the brain after birth. This will give your healthcare team detailed information about the size and contents of the encephalocele. It will also help determine if there are any other problems with the brain. If there are concerns about problems with other organs, such as the heart or kidneys, more tests will be done, including an echocardiogram (ultrasound pictures of the heart) or renal (kidney) ultrasound. Blood may also be drawn for genetic testing. Based on results from all the tests done both before and after birth, and careful examination of your baby, the medical team will discuss options for treatment with you. Treatment options depend on the size of the encephalocele, how the brain has been affected, and other problems your baby may have, as well as your goals and wishes for your baby. Many babies with encephalocele require surgery. If a baby has very severe problems from the encephalocele, some families may choose not to pursue aggressive medical and surgical interventions. The palliative care team, including, nurses, clergy and social workers can give you and your family the support you need. After surgery, your baby will receive care in the hospital’s NICU. Your baby will need to be on a breathing machine until he or she is fully recovered from surgery. The total length of time your baby will stay in the hospital will vary, based on other health issues. Your baby will need regular follow-up visits with the team to measure growth, development, and nutrition. You will want to find a local doctor who is comfortably caring for babies to take care of the routine checkups, immunizations, and doctor’s visits. The program coordinator can help you if needed. You will also need to follow up with your baby’s neurologist and the neurosurgeon from Nationwide Children’s Hospital. Most children with encephalocele have some problems with mental development. Children with encephalocele are also at risk for seizures. Care for children born with encephalocele focuses on preventing problems and improving your child’s abilities. Physical and occupational therapy and early intervention can help your child. Your doctor may recommend genetic counseling to discuss risks for a future pregnancy because encephalocele can be related to inherited disorders. If a couple already has a child with a neural tube defect and wants a second child, the doctor may recommend the woman take a larger amount of folic acid and may prescribe a supplement. She can begin to take it for one to two months before getting pregnant, and continue during the first three months of pregnancy. This may reduce the risk of having a child born with encephalocele.